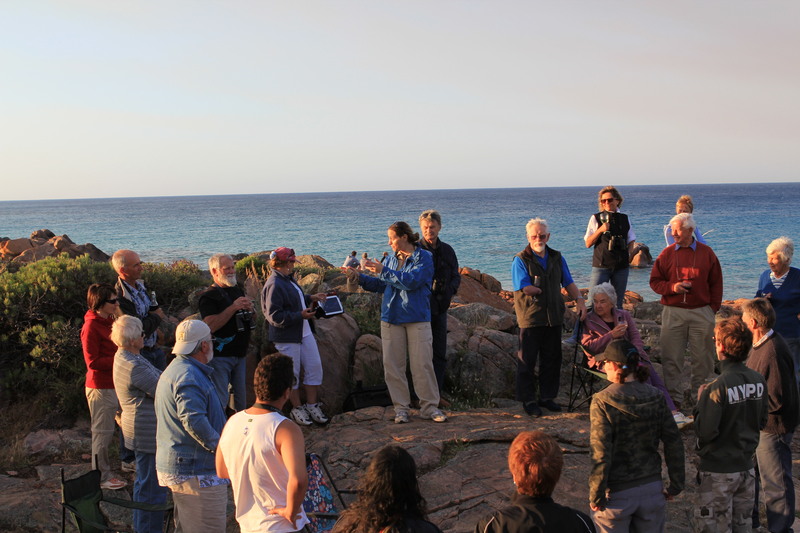 Our partner Ron Glencross from the Dunsborough Coast and Land Care (D-CALC) group was kind enough to invite us to a social sun-downer event with his fellow volunteers on Saturday evening. 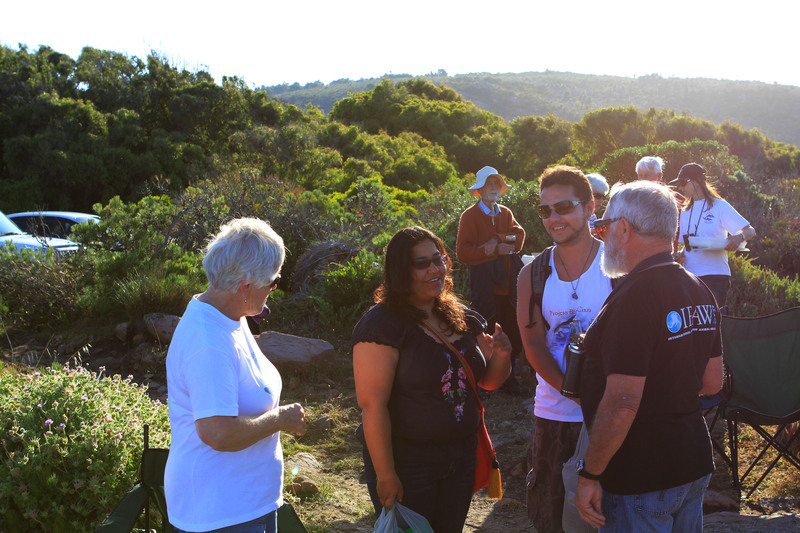 At 5pm we finished our shift to meet everyone at Pt Picquet for drinks, nibbles – and an unexpected amount of wildlife! Word of our meeting had obviously gotten around the marine community because we were joined by bottlenose dolphins, humpback whales breaching in the distance, and four more blue whale pods! It was wonderful to have the opportunity to meet “the people down the hill”. The theodolite teams have a further visual range (out to about 10km) and are able to collect detailed information. Currently the theodolite team focuses effort on the main migratory period, while the D-CALC volunteers at Pt. Picquet collect data over a wider temporal range. 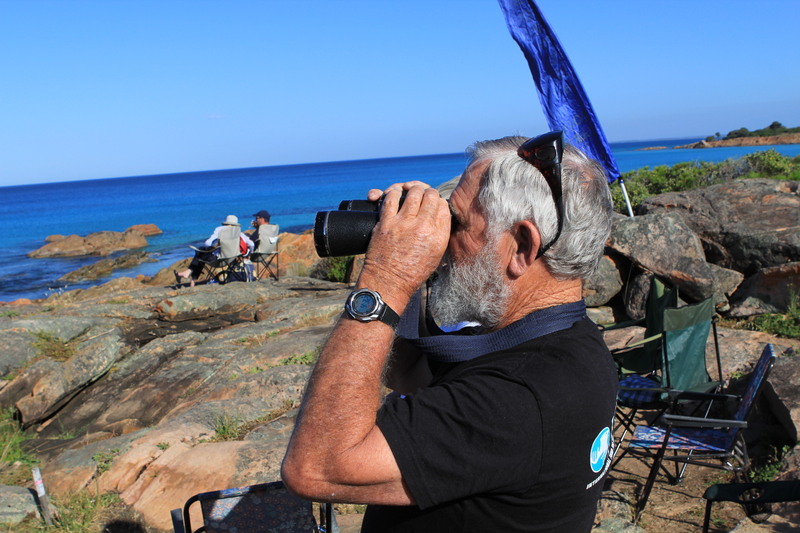 Together, this gives us the “big picture” in terms of whale activity in Geographe Bay. We will be able to create a very detailed picture of how the southwest region is utilised by blue and humpback whales, allowing us to identify significant habitats and advice on any measures necessary to minimise human impacts on these amazing cetaceans. Ron enthusiastically described a summary of the season’s sightings thus far, and invited Dr Chandra Salgado Kent (the theodolite team leader) to describe the workings of the theodolite project. She must have done a good job, because on Sunday morning we were joined up the hill by D-CALC volunteer Paul and his partner Amy, keen to learn more! Our visitors were even kind enough to bring the whales with them – within a few minutes of their arrival, we were inundated with sightings! A humpback mother and calf pod, a few more individual humpies, and a blue whale! Fortunately, Chris Burton (Western Whale Research; WWR) was out on his research vessel Bluey – Chris was able to catch up with the blue whale and get some photo-ID pictures! Every blue and humpback whale has a unique dorsal fin, complete with its own individual scars and markings. By obtaining images of these body areas, we can reliably identify individual whales over many years. This opens a whole new world of information for our research – we can check the photo-ID catalogue to see if that individual whale has visited the area before, how often, and for how long; we can compare it with catalogues from other areas (nationally and internationally) to get an idea of the distribution of populations; and we can assess behaviour at individual levels. Soon after, another blue whale came through the area and we were able to direct Chris to its location so he could secure a photo-ID shot – a great result! Sadly a lack of volunteers this week means that we will be unable to undertake observations Tues-Thurs. So we’d better make the most of tomorrow! ← The Start of a Blue-tiful Season! Brilliant that you saw “TONS” of Whales ! I would gladly volunteer to be an observer – on dry land. Hope the information gathered is beneficial.